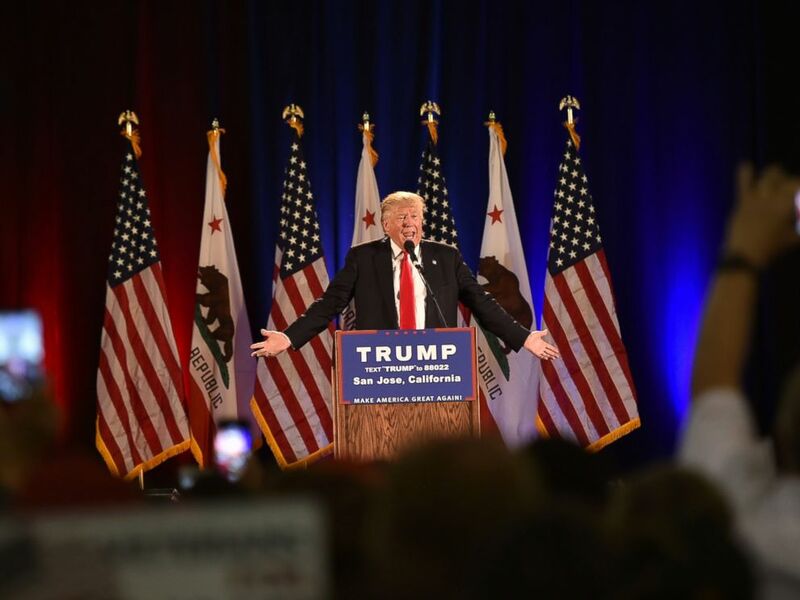 Donald Trump's rally in San Jose, California, Thursday night was marred by violence by anti-Trump demonstrators who targeted the event's attendees and police. San Diego police reported that approximately 300 to 400 protesters gathered outside of Trump's event, which led to four arrests for "for incidents including assault with a deadly weapon and unlawful assembly," Officer Albert Morales said in a statement. "While several physical assaults did occur, the police personnel on scene had the difficult task of weighing the need to immediately apprehend the suspect(s) against the possibility that police action involving the use of physical force under the circumstances would further insight the crowd and produce more violent behavior," Morales said. A police sergeant was one of the ones who dealt some of the brunt of the violence, suffering minor injuries "after a protester struck him with a metal object." Trump's foes surrounded the San Jose Convention Center, where scuffles broke out between them and Trump supporters. Some of the altercations were physical, resulting in bloody injuries, as in the video below. Some Trump protesters surrounded the car of a presumed Trump supporter as the vehicle was leaving the convention center's garage. Protesters were shaking the car and smashed its taillight. Protesters also surrounded and banged on police cars. 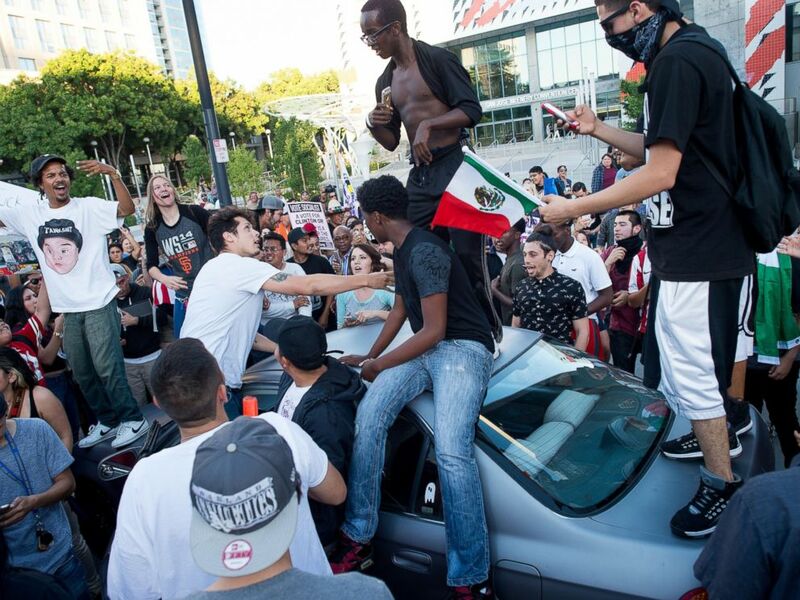 Protesters against Republican presidential candidate Donald Trump kick and jump on a car leaving a Trump campaign rally on Thursday, June 2, 2016, in San Jose, Calif.
Rally attendees heading back to their cars were egged, followed and intimidated by some of the protesters. At one point, a large group of demonstrators surrounded a Trump supporter, throwing bottles and spitting at him as he walked back to his vehicle. Protesters against GOP presidential candidate Donald Trump climb on a car outside a Trump campaign rally on Thursday, June 2, 2016, in San Jose, Calif.
Police instructed protesters over loudspeakers to return home, but at one point, 100 to 200 of them remained, taunting riot-gear-wearing police. As about 200 police officers began marching in lines to push the crowd out of downtown San Jose, some protesters threw street signs and empty cans. Before the violence outside the convention center kicked into high gear, rally attendees listened to the presumptive Republican nominee go after Hillary Clinton, just hours after the Democratic presidential hopeful gave a long speech on foreign policy that Trump described as "pathetic." "I watched Hillary today. It was pathetic," Trump said. "It was pathetic. It was so sad to watch, and you know, she's up there and supposed to be a foreign policy speech — it was a political speech." Republican presidential candidate Donald Trump speaks during a rally at the San Jose Convention Center in San Jose, California, June 2, 2016. The drumbeat of Trump's attacks on the former secretary of state has only grown louder in the last several weeks as he has also targeted her husband, former President Bill Clinton, and President Barack Obama. "Anything Obama wants, she's going forward with, because you know why? She doesn't want to go to jail. That's why, folks,” Trump said. "Bill Clinton hated [Obama]. And Hillary Clinton hated Obama. The only reason she's behaving like this and the only reason she's been dragged so far left, believe me, is she doesn't want to go to jail over the emails, OK? Believe me. That's the only reason." Trump attempted to endear himself to Hispanics, saying, after he spotted a sign in the audience, "'Latinos for Trump,' that's what I like. I love that," he said. "Latinos! We're doing well with the Latinos. Nobody knows about it yet. We're bringing so many jobs in — you watch what happens. The Hispanics, we love the Hispanics." ABC News' Tom Llamas and Alex Stone contributed to this report.